Shoe Palace is a privately-owned shoe retailer with more than 150 outlets in the United States. The company was founded in San Jose, California in 1993 by its current owner, the Mersho family. It grew to 20 stores by 2009 and 50 by 2014. 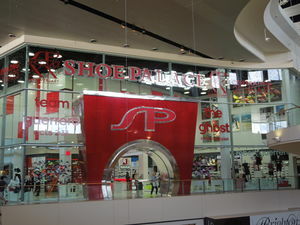 Shoe Palace retail locations are often found in malls or shopping centers. They have a modern and family-friendly atmosphere. The company primarily sells athletic and casual shoes from brands like Jordan, Nike, and Adidas. In addition to shoes, it also sells some accessories and apparel. 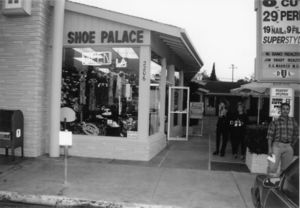 Shoe Palace was founded in 1993 in San Jose, California by the Mersho family. The Mersho siblings grew up in an entrepreneurial family. Before starting Shoe Palace, the siblings and their father regularly sold goods at a local flea market. They started out selling used stereos, watches, and shoes, among other products. Each sibling took turns selling goods at the booth with their father. Eventually, the Mersho family expanded to additional booths and started focusing more on athletic men's shoes. The Mersho siblings felt a more traditional retail location would add legitimacy to their shoe-selling business. The first Shoe Palace location was started in April 1993 with about $10,000 in financing. It was just across the street from the Oasis cafe operated by the founders' mother. Initially, the Mersho family sold only a couple shoes per day and income from the flea market kept the retail location afloat. Over time, the company became better-known locally through word-of-mouth and sales picked up. The second Shoe Palace was opened just a few months later, in August 1993. Shoe Palace's first mall location opened in October 2003 at the Oakridge Mall in San Jose. The Mersho family had been trying to open their first mall location, but most malls preferred Shoe Palace larger, more established rivals. At the time, the Oakridge mall was just finishing a major renovation project that nearly doubled its size and left room for new retailers. The mall's leasing manager went to a Shoe Palace location and was convinced by his experience to lease a space to Shoe Palace. 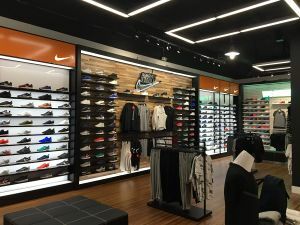 By this time, Shoe Palace also started building business relationships with major shoe brands, like Nike, Adidas, and Jordan. The company expanded out of San Jose for the first time in 2005 with a new location in San Bruno, California, then out of the Bay Area in 2009 with a retail location in Los Angeles. 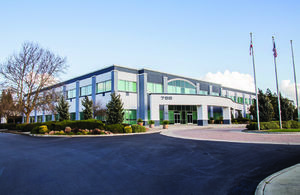 Shoe Palace grew from three stores and about 20 employees in 2000, to 20 stores and about 220 employees in 2009. Then, the business expanded out of the state with its first retail location in Texas in 2011. In 2011, Shoe Palace opened its third Las Vegas location at The Fashion Show Mall. This location was nearly twice the size as was typical for Shoe Palace and had a more modern look. It became the blueprint for many of Shoe Palace's future retail outlets. In 2012, Shoe Palace published a website for the first time, after shoe brands began to loosen rules about allowing retailers to sell their products online. In 2014, Shoe Palace acquired competing retailers Nice Kicks and Anthem. Nice Kicks was a single-store boutique founded in 2011 and focused on more fashion-forward shoes. Anthem was a high-end chain with three locations that focused on more casual-style shoes. Both became subsidiaries of Shoe Palace and expanded into three and seven stores respectively. By 2014, Shoe Palace had grown to 50 locations in five states: California, Arizona, Nevada, Texas, and New Mexico. In 2017, Shoe Palace opened seven locations in Florida, expanding to the east coast for the first time. Shoe Palace has more than 150 retail locations. They are primarily located in California and the southwest of the United States, but there are some new outlets in Florida. A typical store is about 4,000 square feet and is operated by 10-15 employees. The stores are often located in malls or shopping centers. Shoe Palace targets consumers that are into sports, exercise, fitness, and casual-wear. Its locations have a modern, family-friendly feel. Shoe Palace stores primarily sell shoes, including athletic wear, sandals, and boots. The biggest sellers are Jordan, Nike, and Adidas shoes. Some shoes are designed for specific sports, such as basketball, running, or general gym shoes. Sizes range from children's sizes to size 15. About 85 percent of Shoe Palace's revenues are from shoes, but it also sells apparel and accessories. Some of its shoe and apparel sales are for sports teams, weddings, or other events whereby the organizers would like all participants to have the same attire. Often apparel is branded after a popular movie or athlete. For example, in 2017 Shoe Palace created a line of Justice League-branded apparel before the November release of the Justice League movie, in cooperation with Warner Brothers. The line included sneakers, sweaters, jackets, t-shirts, and other apparel. Shoe Palace promotes their shoes and retail locations through billboards, magazine ads, and sponsorships with celebrity athletes. Initially, many athletic sponsorships were with football players, but more recently the company has focused more on boxing. Many of their sponsorships are tied to athletes that do charitable work with families or have a "rags to riches" story of rising to the top of their profession through hard work. Some of the athletes Shoe Palace has sponsored include Andre Ward, Frank Gore, Colin Kaepernick, and Robert Guerrero. Shoe Palace donates to a variety of local charities. The company provides free backpacks filled with school supplies in to students returning to school in low-income areas in August each year. On Thanksgiving, it provides free Thanksgiving dinners to local low-income families through a program with a Christian organization called Saint Vincent De Paul. In 2016, for Christmas, Shoe Palace partnered with the San Francisco football team, the 49ers, and others to arrange an all-day event at the local football stadium for low-income families. The company also helped raise $20,000 to support victims of hurricane Harvey in 2017.